How to organise a Python Beginners Workshop | So Long. The material is perfect for an evening and a complete day. We chose the Friday evening for installation covering installing Python3, a text editor and Github Desktop as well as some basics about git, repositories and the creation of a GitHub account (see InstallationParty-Slides). The following Saturday we spent with coding. First, we typed code in the terminal – all participants have done the same on their computer. Later we created tasks in the text editor. I prepared five tasks, so that the participants could use their new python knowledge. Every python file in the repo is ready for getting executed in the terminal – and the comments give tips how to expand the code. We had 11 participants and 6 coaches (including Marie and me plus one dog). That was quite a good mix, because there will be a lot of questions. Only the first 2.5 h in the morning of the second day not all of the coaches were busy, because we did all things step by step together in the group. So it might be okay if half of the coaches join after lunch. Teaching how to code is great! The installation part might be more fluent in very small groups. Otherwise, it is very difficult to find the right point in time to do the next step together. Creating a text adventure is a great task! People became very creative and had a lot of fun while understanding basic concepts of programming. Make it as interactive as possible: ask questions, let people write a lot of code and give them space for own ideas. Many people are interested in learning python. We contacted the lovely local PyLadies group and they allowed us to make our workshop at PyLadies workshop. 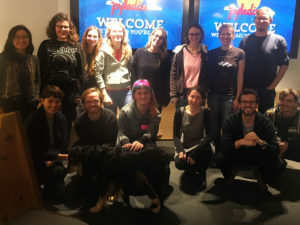 So we created a meetup in their group on meetup.com. Two tweets and some days later we had a waiting list. If you need further explanations feel free to contact me on twitter or via mail – or contact PyLadies. Nächster ArtikelDie Vorbereitungen sind abgeschlossen.